So what do you get? If you have read the Porsche review then there are a lot of similarities, but, there are a few differences too. This, being an earlier design, may well contain some prototype dimensions but I can’t see them affecting things too much. Firstly it has a slightly slower motor in the SCX Pro speed. This is rated at 23,000 rpm at 14.0v and although not a ball of fire, it allows this model to become infinitely more drivable on the shorter, more technical circuits, unlike the Porsche which was very much a handful with controllers above 25 ohms impedance. The gearing is the same with the pinion being brass this time. Hubs for all intents are very similar but the rear tyres are a lot narrower than the GT3. Again, this could pose a problem on long sweeping high speed raceways but may well come into their own on tighter circuits. 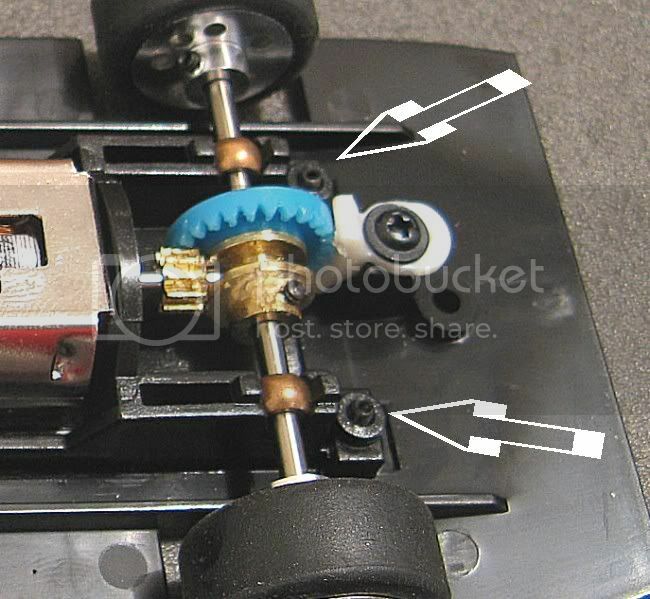 The front axle runs in an elongated bearing and this transforms the model into a ‘tripod’ configuration. I would have liked to see it ‘on all fours, but that’s not a difficult conversion. Once again the business end sits in a floating pod. The body screws can stay tightened for all but the roughest plastic tracks and adjustment of the pod screws should enable you to fine tune the chassis/pod float to match your track. It would have been nice to be able to access these screws from the outside but like a lot of other models, you have to take the body off to carry out essential adjustments. One thing confuses me though with both this and the GT3! These are NON magnet models, right? So why are they so light? 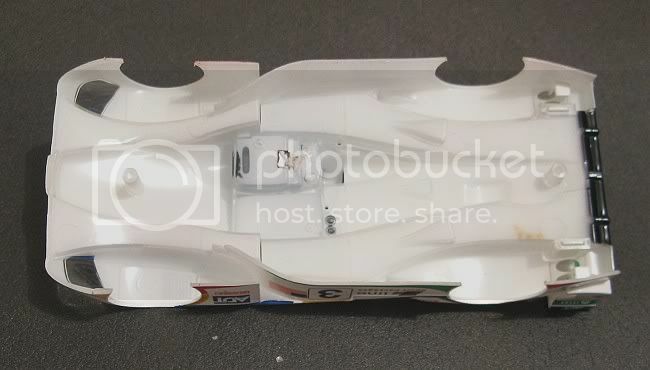 I understand that the tyres are the most important part of the equation but I haven’t yet seen a tyre which will make 78 grams of 1/32 non magnet slotcar work well?? On ANY surface! This model is going to have to weigh in at at-least 85 – 90 grams to be in with a chance and running on the absolute latest rubber or urethane? No matter, the chassis is very tidily laid out and is a credit to SCX who until a year or so back, specialized in good home use products. The body is fixed with just two screws and when fitting for the first time I recommend a good fitting screwdriver be used! The screws will be tight as they cut a new thread and a poor fitting screwdriver will see you turn the heads out of the screws if not careful! Body detail is good and as this is an out and out racer, it would be unfair on it to be too critical of the finer detail. As it happens it IS well detailed and things like the rear view mirrors are just inside the roll over zone so they should enjoy a reasonably long life. 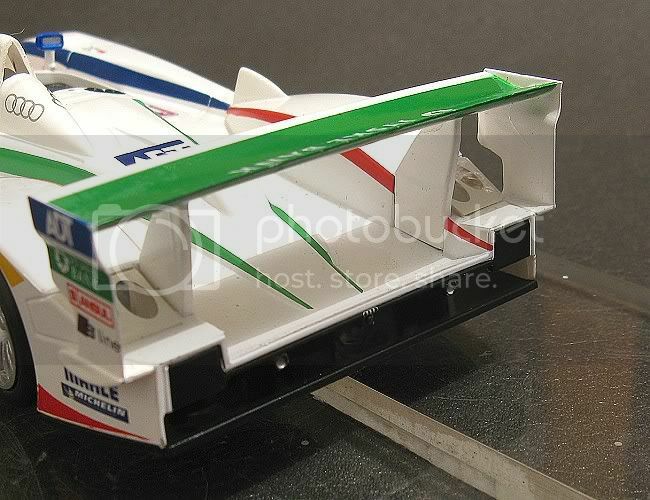 The rear wing is attached by its pylons AND the outer edges of the wing. This too should increase its longevity. All other body detail like grilles and lights are absent and the driver is a half driver. Everything axle wise is alloy and grub screwed. The crown wheel has a brass hub and the wheels are aluminium. Axle bearings are the ball type and are a tight fit in their mounts. The front axle too has the height adjustment screws but this is purely academic as the axle can still slop up and down and not contribute to the model’s stability. On this model I have adjusted the brake on the crown wheel so that it just clears in drive. This shortens the brakes actuating time. Probably of no real significance but just the same it’s the way I like it. One thing that I have noticed is that with the body screws tightened the pod has a definite reluctance to slide easily. I have tried repositioning the RI condenser but haven’t really achieved much. The pod movement becomes a little more free with the body screws slackened so there must be a point of contact somewhere in the model, this will need further investigation I think. Also, I notice there is no side play between the pinion and the contrate? The problem appears to be in the axle bushes. Being round bushes, if they don’t go into their mounts squarely when the axle is fitted, they tend to bind slightly on the axle. The trick here would be to remove the motor and get the axle running freely and then reinstalling the motor, problem solved! Another area for improvement is the guide. 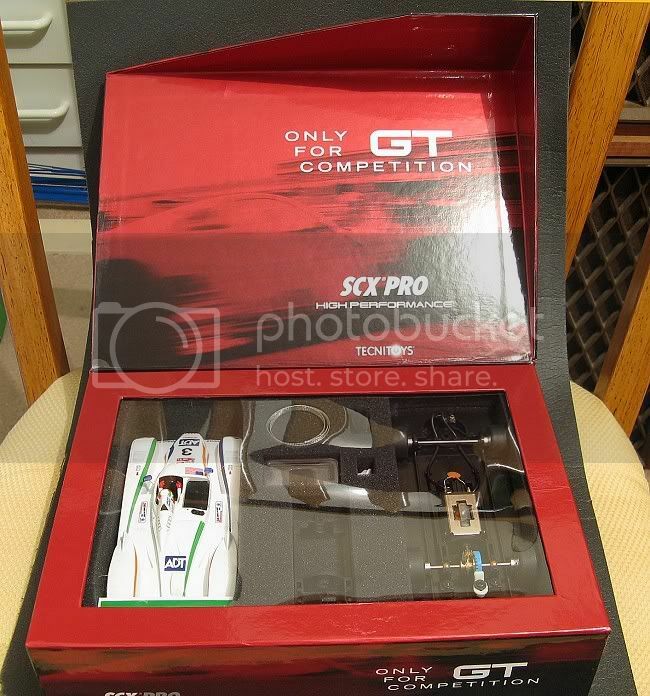 This model contains the early Pro GT guide and is a bit shorter than the later GT3 guide. At 5.80 mm it is also a bit shallow too. With the braids on there is less than 5.40 mm slot penetration! The model comes with a spare guide but this is identical to the original. The only other points of observation are the lead wire clips on the chassis. The lead wires stick up pronouncedly at the front. Once the body is fitted they press hard against it. I have slid the lead wires back a bit on this model to minimize the pressure on the guide. 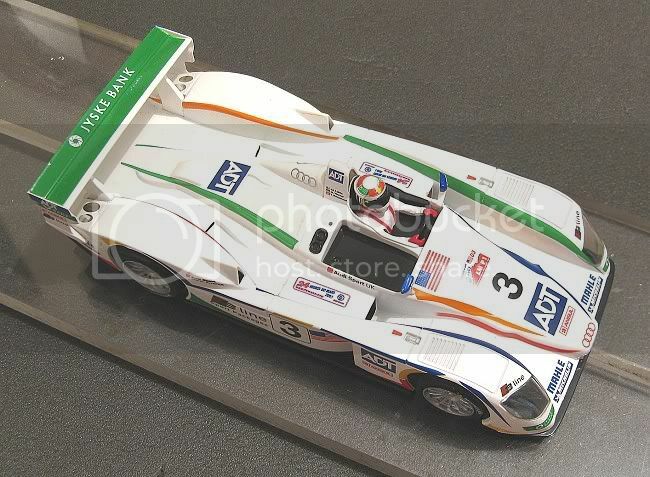 One decided novelty with this model is the spare motor pod. This isn’t for the SCX range of motors. 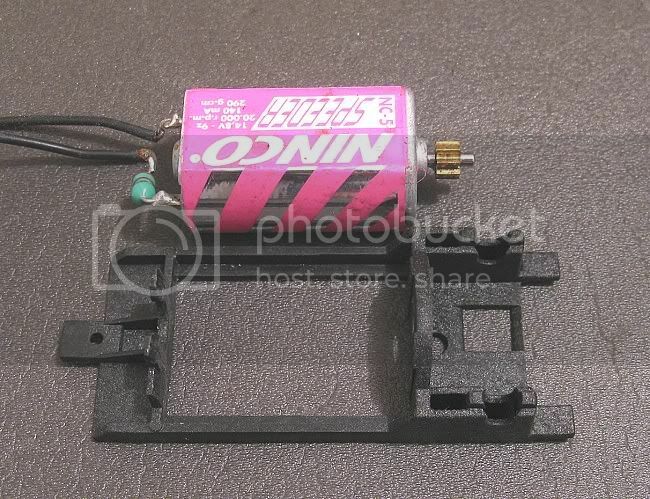 It is for the long boxer type motor such as the Ninco NC5 etc. They fit comfortably into the spare pod and as a precaution should be hot glued into place. Finally, SCX supply a minute Allen key to adjust the axle stops. They also supply a spare set of screws and enough braid to recondition the guide at least three times and there is also a spare brake and screw in case you wear the old one out!!. So what’s left? A run on a good track. As it happens, I am off to the home of the Red Team tonight and I will be putting this little gem in my race box. Stay tuned. Front axle width				63.0 m.m. Rear axle width					63.0 m.m. Rear wheel diameter				20.1 m.m. Progress					23.74 m.m. per motor rev. Rear tyre tread width				7.00 m.m. Guide thickness (median)			1.50 m.m. Well, I’m back now from the Red Team. I have sobered up and hopefully my experiences on the 21 metre board track weren’t too much influenced by the products from McLaren Vale (S.A.) So, as best I can remember, this is what I found. I waited ‘til about mid evening. By then the track had livened up and conditions were going to be right to make a fair assessment of the model. The race management system was zeroed and I pushed of fairly quickly and spent a few laps getting used the models idiosyncrasies and surprisingly there were very few! The model drove as if it had already been fettled for the occasion and I was soon lapping in the mid to low sevens, seven dead being a good time for this track, especially with a model in SOOB condition! My misgivings about the narrow tyre width were unfounded and as it proceeded the lap times continued to drop, tenth on tenth. Once the fastest lap reminder stopped I then took it onto the ragged edge and found the model behaving almost totally predictably. Eventually an understeer deslot showed the guide was indeed a tad too short, but this is something that can be easily addressed. Final fastest lap was 7.061 seconds. This represents a very quick model for out of the box. Even Slot.its have had to have attention before achieving this kind of speed on this track! So what is the secret? 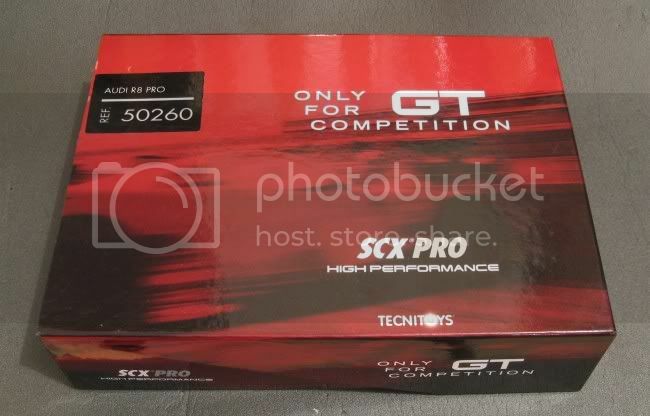 Well firstly the Pro Speed motor is a lot more tractable than the RX4H even if it isn’t as quick. Totally drivable with a 45 ohm controller right across the trigger range, unlike the Porsche which came in with a bang half way down. The model’s ‘footprint’ is also a major contributing factor. A wheel at each corner leaves the centre of gravity well inside the roll over points and the model is very close to the track too! It is my view that with ten to fifteen grams of ballast spread evenly either side of the motor and possibly some slightly wider sanded rear tyres would see this model contend for the Red Team fastest lap award currently held by an unbelievably quick Team Slot Audi Quattro at 6.881 sec. 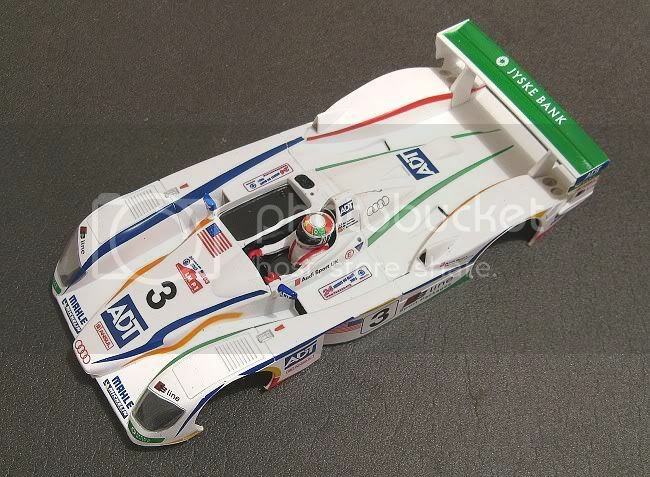 The closest Slot.it being a 7.189 from the Lancia LC2. So a potentially good model on a medium length circuit but still an unknown on a long fast track. But I suspect it would take little alteration to put it up with the leaders. 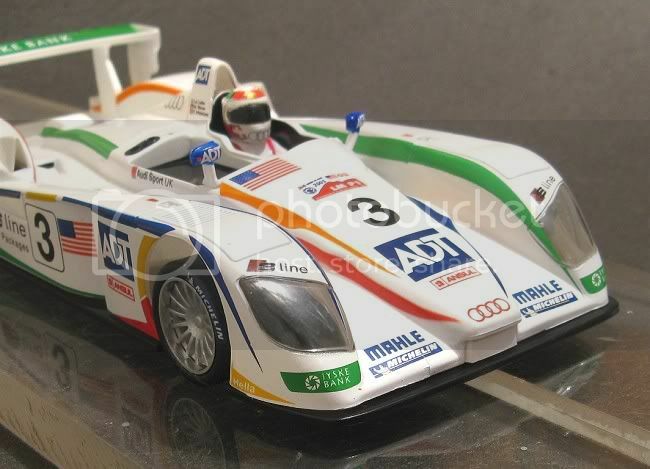 I quite like this model purely from a racing perspective but from a collectable view I’m not happy with the out of scale wheels and tyres and lack of detailed substance in the cockpit and behind the headlights, but I suppose these aren't necessary when racing the higher end of competition. A great non magnet model and heaps of fun. I look forward to taking Kev on with his model, not sure what I would put against it, but we’d find something! 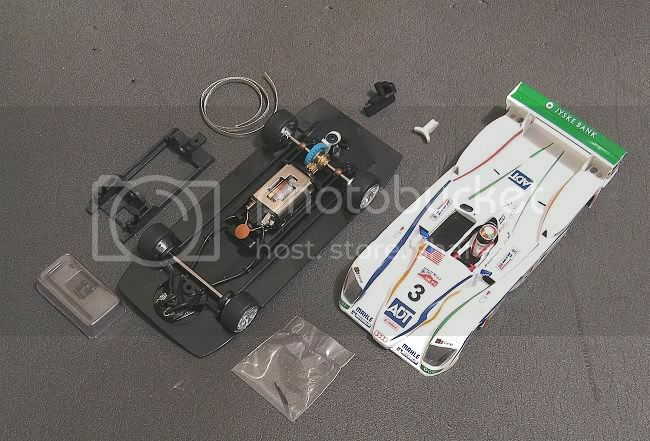 Many thanks to Q32/Slotcar Legends Racer Kev Brettle (Buzzard) for the loan of this delightful model straight out of the box.